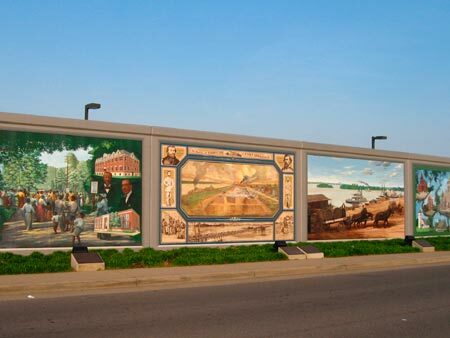 The Floodwall that protects historic downtown Paducah from the Ohio and Tennessee Rivers overflowing their banks includes three city blocks of painted murals that capture important moments in Paducah's history. The murals were designed & painted by Robert Dafford and the Dafford Muralists of Lafayette, Louisiana. The project began in 1996; the last panel was completed in 2007. Each mural panel has an interpretative plaque with a short history lesson on the scene depicted in the panel. Each panel also has its own spotlight making the mural walk an enjoyable evening stroll and tourist attraction. In addition to enjoying 45 attractive works of art, taking the mural wall tour serves as a multi-media history lesson on Paducah and NW Kentucky. < < < This panel celebrates the day in July 1996 that all three of the Delta Queen Steamboat Company's boats (Delta Queen, Mississippi Queen, & American Queen) docked at Paducah at the same time. Shown here are the "Paducah Ambassadors" welcoming the Queens. < < < Paducah experienced strong economic growth during the heyday of riverboat trade from 1870 to 1915. Here packet boats unload at the Paducah Wharf Boat which was permanently moored at the foot of Broadway Ave to facilitate the loading and unloading of passengers and cargo. This mural depicts the day on November 11, 1803 when the Lewis & Clark Corps of Discovery passed by Paducah on their trek to find the Northwest Passage. This panel commemorates the Civil War era where pro-Confederacy Paducah was occupied by Union General US Grant and a pontoon bridge was built across the Ohio to Ft. Anderson on the Illinois shore. In 1950 the US Atomic Energy Commission began plans to build a Nuclear Gaseous Diffusion Plant ushering in the Atomic Era to Paducah. Today the facility is the nation's only uranium enrichment facility and is a global supplier of enriched uranium for electricity production. If you visit Paducah be sure to take time to visit the Floodwall Murals, a unique artistic creation and historical exhibit to boot.